Many people make the decision to downsize their home as they get closer to retirement. In fact, 42% of people plan to downsize at some point in their life. 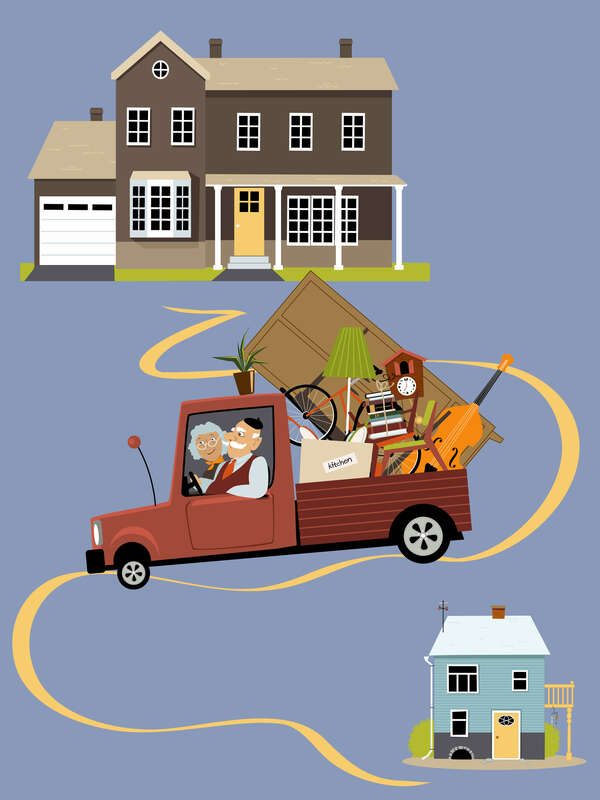 The benefits of downsizing can be numerous depending on your personal preferences. For example, downsizing could save monthly costs on property taxes, utilities, and maintenance. Those are all very helpful when living on a fixed income in retirement. Of course, how to use the money from downsizing is not always an easy decision. People have different needs and goals as they enter retirement. Therefore, there is no hard and fast rule about how to use proceeds from downsizing as part of your retirement planning. In this article, we will look at some ways people use their newfound cash as part of their retirement planning to ensure they can live their golden years the way they always have dreamed of. Having a nice nest egg built up for retirement is a great way to ensure you can enjoy your retirement years with as little stress as possible. Using the funds from downsizing can quickly boost your retirement savings. If you are still a few years away from retirement then those additional funds can have some extra time to grow in investments and provide even more funds when retirement rolls around. This is where good retirement planning comes into play. How long until you may need these funds? What are your goals and dreams for retirement? Those answers will determine how you should invest the funds from downsizing your home. It is becoming more and more common for older generations to give to loved ones while they are still alive. 22% of people report receiving large sums of money from relatives that are still alive. This is much different than the traditional method of estate planning where money is given after death. One of the main advantages of giving money while you are still alive is that you can see the benefits of that money being put to use. Most importantly, you can ensure it makes it to the right people as well. Another great advantage is that this money can be given tax-free as long as it remains under the IRS gift tax exemption limits. This means it could be easier to manage tax burdens for recipients of the money as compared to giving all of the funds at once. Traveling is one of the top retirement planning goals of many people. Having your own vacation home gives you the freedom to travel on your own schedule. Downsizing is a great way to help find the funds necessary to purchase a vacation retreat. There is also the possibility of renting your vacation home while it’s not in use in order to generate some additional retirement income. Of course, you will want to consider the tax implications of this additional income to ensure you are properly prepared once tax season rolls around. This may be one of the least exciting options on this list but it is one of the most important. As you age, there may be additional expenses that you are not completely prepared for. One example of insurance to consider as you near retirement is long-term care insurance. Long-term care insurance provides coverage in the event that you require long-term care beyond what is covered by Medicare. Many long-term care facilities can cost tens of thousands of dollars per year. This expense can quickly put a dent in your retirement savings and leave family members scrambling. Long-term care insurance is a great way to protect against these expensive costs and provide security for you and your loved ones should a need for long-term care arise. While retirement planning gives many people hope to enter their golden years with little to no debt. Downsizing is a great opportunity to pay off any outstanding debt and take that weight off your shoulders. When paying down any kind of debt, you should strategize how you plan to pay the debt. It’s important to sit down and consider all of your debts before making your plan. The next step is to rank the debt from highest interest to lowest interest. If you are able to pay off all debt in one swoop, then this will be an easy exercise. However, if you will still have some debt remaining after using the funds from downsizing, you want to ensure that the debt is low interest. Focus on paying off things like credit cards and unsecured loans first. Of course, once you are out of debt then the real goal becomes remaining that way. Planning how to use your retirement income and budgeting for all expenses will help ensure that you do not fall into the trap of credit cards and loans more than is necessary. There is no rule saying that you have to use all of your downsizing funds for one single purpose. You may wish to spread the funds out to help accomplish a number of goals. If downsizing is part of your retirement planning then you should make a list of goals and how much you wish to allocate to each goal. You will also need to consider any tax implications of the sale of your home when considering how much money you will have to allocate to each goal. This can be complicated once you begin diving deeper into your plans. The good news is that you are not alone in retirement planning and downsizing. Our retirement planning experts at Mooney Lyons can help you accomplish your goals and make the most of the money you earn from downsizing your home. Contact us today for expert advice on the next steps to take as you enter retirement.